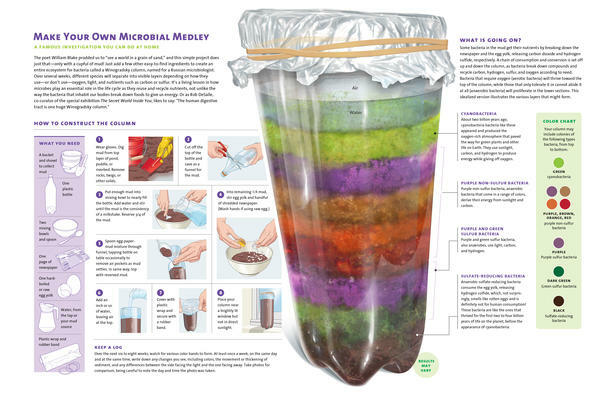 The Winogradsky column, invented by Sergei Winogradsky, consists in a transparent cylinder for analyzing microbial life by observing how the metabolism of micro-organisms evolve over time in stratified layers. By producing a small closed ecosystem, the column enables observing how bacteria can survive by providing a temporal and spatial visualization of layers such as in ecology, microbiology. S. Kuznetsov, W. Harrigan-Anderson, H. Faste, S.E. Hudson, E. Paulos, Community engagements with living sensing systems, Proceedings of the 9th ACM Conference on Creativity & Cognition C&C'2013, ACM Press, pp. 213-222. Is it passive or active visualization? In a way there is some automatic update ?